It’s time to think of Maisie Jane’s as your go-to place for healthy—and just plain delicious—snack opportunities. We have so many to choose from. I thought I’d count the ways you can bring little moments of enjoyment of life to your daily routine! Wait, should I say something more about that first? Well, I’ve been exploring how feeling deprived tends to sabotage my best attempts at dieting. It just does not work! Maybe because when I indulge some part of me wants to make up for all the deprivation I’ve felt throughout the week. Or, more likely, I’ve been sending an unconscious message of “poverty” to my mind so my body holds on to its weight (for my sake) for dear life. So I’ve been slowly retraining myself to enjoy my life, including the maybe not so diet-like choices a person enjoying the great abundance and prosperity of being alive might eat. And an interesting thing has happened. I enjoyed a special treat with a good friend during a coffee break yesterday and later in the evening I didn’t feel tempted by an offer for a bowl of ice cream. I didn’t reject it because of my diet—I didn’t want it. I didn’t feel deprived of sweets. I felt satisfied! Well, that’s exciting. So I’m exploring whether making sure I have tasty snacks to choose from in addition to carrots and celery sticks might have a similar effect. 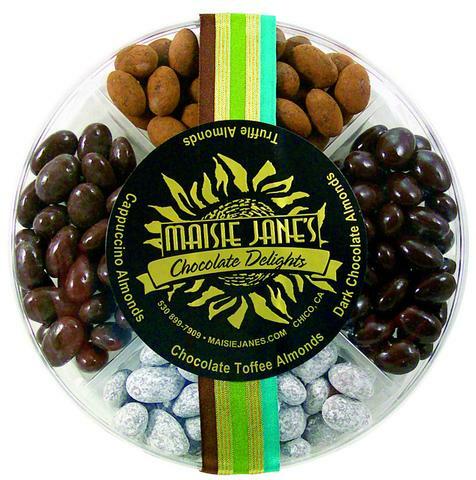 What does Maisie Jane’s have to offer for your snacking satisfaction? Here’s a great idea for you: Did you know that every week we bake fresh the best Caramel Corn and Almonds around? This, however, is not a snack I find easy to show any moderation around! But adding a little bit in a mix of other choices provides both that life-is-good satiation I need and enough nutrition to settle my appetite down. What do I add it to? Well, this is where it gets fun. It goes well with so many things! For example, try it mixed into a bowl of our Organic Curry Spice Cashews. I know, it sounds weird but that combo of spicy and sweet tastes so good! Dried chopped mango goes well in this. 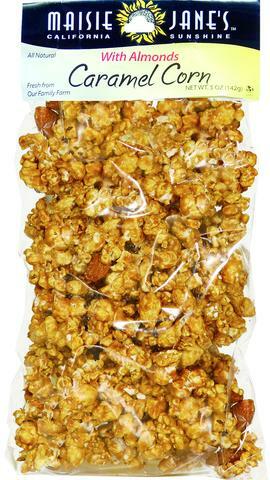 Or try the Caramel Corn mixed with one of our chocolate covered nuts or our Fruit Medley chocolate-covered treats. 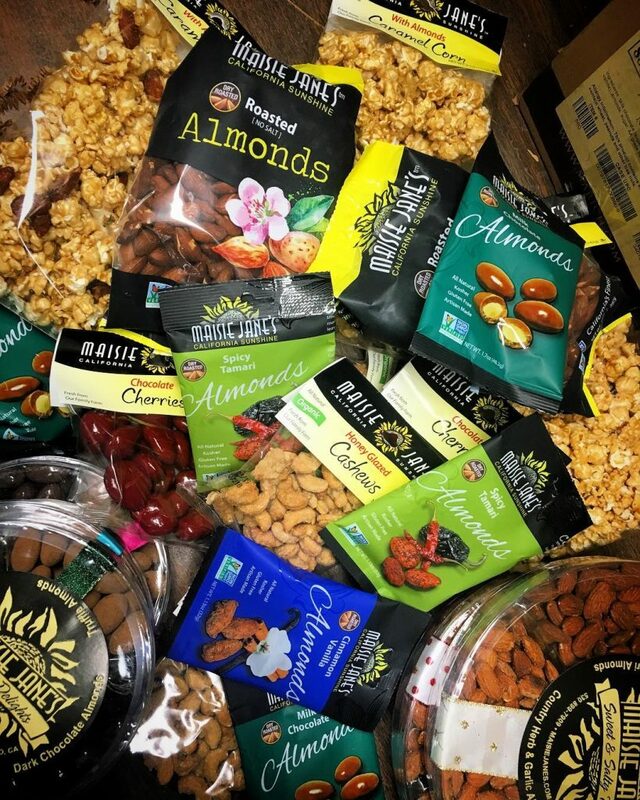 Another opportunity is our wonderful array of flavored and chocolate nuts. Again, mixing is fun! The combination of Dark Chocolate Almonds and Orange & Spice Almonds is very good. I love our Cappucino Almonds and Chocolate Cherries! Dark Chocolate would be delicious with those, too. Prefer less risk-taking in your snacking? Try our premixed right-sized snack packs or indulge in a gift round that supplies several choices in a ready-to-serve tray. With so many great snacking ideas to choose from, you can’t go wrong!